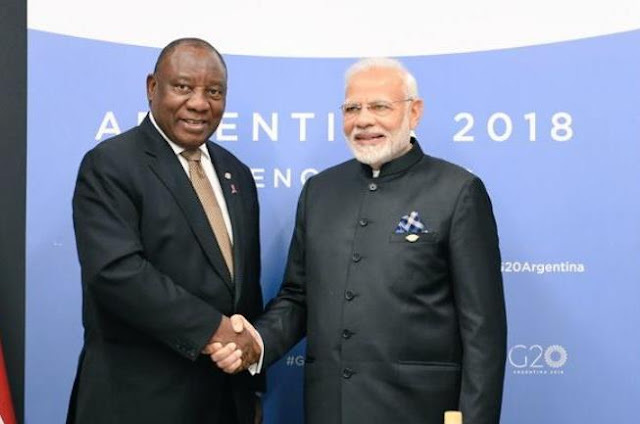 Ramaphosa's visit will further cement business and people to people ties between India and South Africa. Since 1950, India has been hosting head of state or government of another country as the state guest of honour for Republic Day (26-January)celebrations in New Delhi. The Food Safety and Standards Authority of India (FSSAI) has launched media campaign “Heart Attack Rewind” for the elimination of industrially produced trans-fat in the food supply. It is in line with FSSAI’s objective to get Freedom from ‘Trans Fat: [email protected]′. Globally, trans-fat intake leads to more than 500,000 deaths from cardiovascular disease every year. Trans-fat is made by adding hydrogen to liquid vegetable oils to make them more solid and to increase the shelf life of foods. According to the Ministry of Civil Aviation, they started the registration process through a portal “Digital Sky platform” for drone operators in the country. Earlier, The Union Government has announced the release of its Civil Aviation Regulations to enable safe flying of Remotely Piloted Aerial Systems (RPAS) popularly referred to as drones. According to Minister for Civil Aviation Suresh Prabhu, Drones are an industry of the future and it is a matter of great pride for the country that we are now at the cutting edge of the rulemaking in this industry. Today, The 80th Session of the Policy Commission of the World Customs Organization (WCO) starts in Mumbai. The Session is being organized by the WCO and hosted by the Central Board of Indirect Taxes and Customs (CBIC), India. More than 30 countries along with their delegations will be participating in the three-day long discussion on various matters related to customs. The Indian delegation will be headed by S Ramesh (Chairman CBIC) along with Member PK Das and their team of senior officers. Nepal's Prime Minister K.P. Sharma Oli has inaugurated the two-day Asia Pacific Summit-2018 in Kathmandu, Nepal. The theme of Summit is "Addressing the Critical Challenges of Our Time: Interdependence, Mutual Prosperity, and Universal Values". Around 1500 participants from 45 countries, including India, attending the summit. They are discussing various global issues, including peace, development, good governance and the role of parliamentarians, climate change and the role of media. The 24th meeting of Conference of Parties (COP-24) to the United Nations Framework Convention on Climate Change (UNFCCC) has begun at Katowice, Poland (2-14th Dec 2018). The Conference ‘COP-24’ is very significant as it is expected to finalise guidelines for implementation of the Paris Agreement adopted in 2016. The Agreement also focuses on developing countries need to adapt to adverse impacts of climate change, in a manner that it does not put an additional burden on them. The union Environment Minister, Dr Harsh Vardhan is leading a delegation from India. According to union Environment Minister Dr Harsh Vardhan (leading Indian delegation), India expects that COP-24 should be able to frame guidelines, which are pragmatic and gives due consideration to challenges and priorities of developing countries. India is setting up a Pavilion (theme - ‘One World One Sun One Grid’) to create awareness about India’s positive climate actions in various sectors of the economy. Andres Manuel Lopez Obrador (65-year) has been sworn in as the new Mexican President. Lopez Obrador also reaffirmed his intentions to sell Mexico's official presidential plane, to not live in the presidential palace. He has announced his intention to promote a recall referendum during his administration, adding the promise that he will never seek re-election. International Day of Persons with Disabilities is an international observance promoted by the United Nations (UN) since 1992. The theme for this year is “Empowering persons with disabilities and ensuring inclusiveness and equality”. This year’s theme focuses on empowering persons with disabilities for an inclusive, equitable and sustainable development as part of the 2030 Agenda for Sustainable Development. Today, Vice President M Venkiah Naidu ill confer the National Awards on Individuals, Institutions, Organizations, States and Districts for their outstanding achievements and work done towards empowerment of Persons with Disabilities. Today, Bhopal is observing 34th anniversary of gas leak tragedy as on the intervening night of 2nd and 3rd December in 1984. Several hundred people were killed, and scores of people were maimed for life when the Methyl Isocyanate gas was leaked from the pesticide plant of Union Carbide. The International Day for the Abolition of Slavery organized every year on 2nd December by the United Nations General Assembly. The Day was first celebrated in 1986. The Convention for the Suppression of the Traffic in Persons and of the Exploitation of the Prostitution of Others was approved by the United Nations General Assembly on December 2, 1949. Today, the 12-day joint exercise between Indian Air Force and the United States Air Force, ‘Cope India 2019' have begun at Kalaikunda and Panagarh Air Force Base in West Bengal (India). The objective of the exercise is to provide operational exposure and undertake a mutual exchange of best practices towards enhancing operational capability. It is the fourth edition (last one in 2010) in the series of bilateral joint exercise held by the Air Forces of the two nations which is conducted in India. The exercise will host more than 40 aircraft including F-15 & C-130H aircraft of USAF. The IAF contingent will comprise of Su-30MKI, Mirage-2000, Jaguars, IL-78, C-130J, AWACS & AEW&C aircraft. According to an official release, The GST collection in the month of November 2018 stood at 97 thousand and 637 crore rupees (in October-crossed one lakh crore rupees.). Out of the total GST collection, the CGST collection is 16 thousand and 812 crore rupees. SGST is over 23 thousand crore rupees while IGST collection stood at 49 thousand and 726 crore rupees. 11 thousand and 922 crore rupees have been released to the states as GST compensation for the months of August and September this year. GST is categorized into CGST, SGST or IGST depending on whether the transaction is Intra-State or Inter-State. CGST is a tax levied on Intra State supplies of both goods and services by the Central Government and will be governed by the CGST Act. SGST is a tax levied on Intra State supplies of both goods and services by the State Government and will be governed by the SGST Act. IGST is a tax levied on all Inter-State supplies of goods and/or services and will be governed by the IGST Act. Atlawim Debebe (Ethiopia) has won the Pune International Marathon (33rd year) with the timing of 2 hours 17 minutes 17 seconds. Teshome Getachew (Ethiopia) claimed second and Bekele Asefa ((Ethiopia) third position. In women’s Full Marathon Pascalia Chepkogei (Kenya) stood first with the timing of 2 hour 50 minutes 27 seconds. Karan Singh (Bombay Engineering Group) stood first in Men’s category among Indian runners this year. In women’s Full marathon Urvi Tambe stood first amongst Indian participants. Along with 100 foreign runners, more than 15 thousand people participated in this oldest International Marathon this year.